1924. 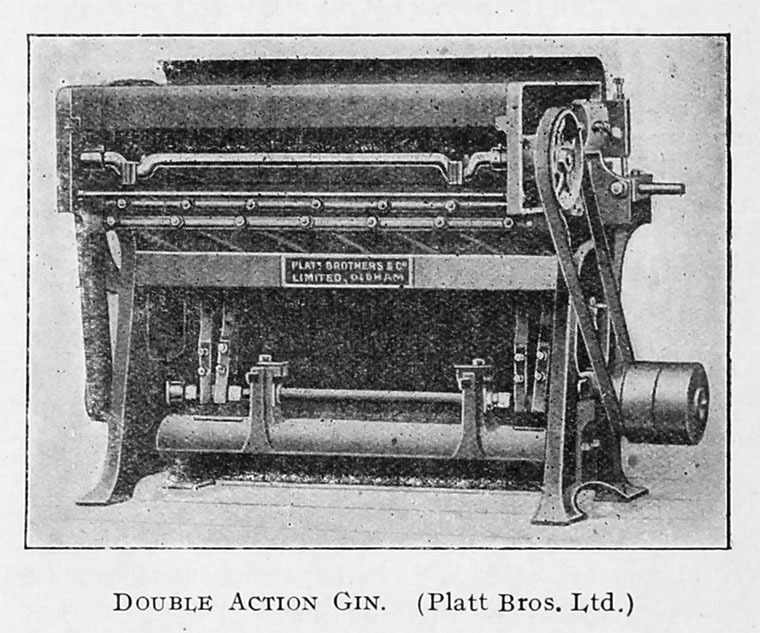 Platt Brothers Double Action Gin. 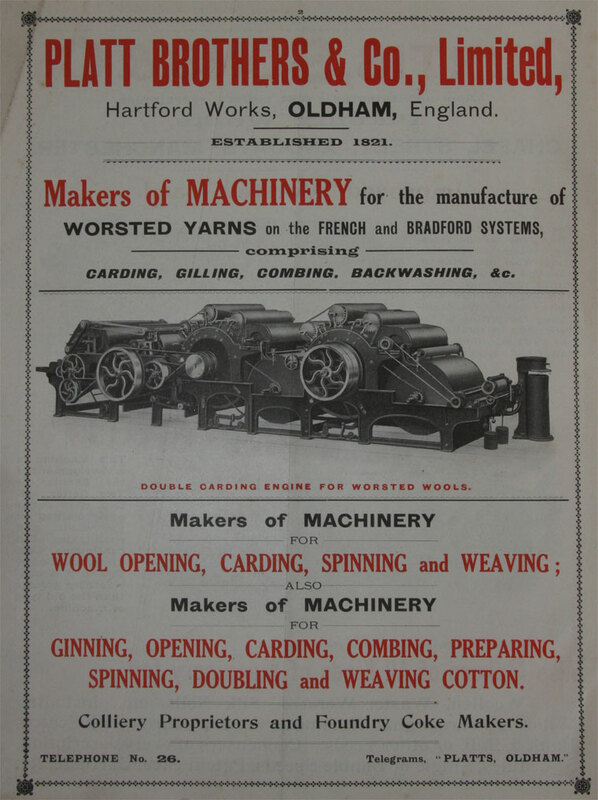 The Platt family began to manufacture machinery for the woollen industry from a small workshop at Nicker Brow, Dobcross, Saddleworth, Lancashire, before moving to Oldham, developing large works on two sites, at Greenacres Moor and at Werneth. By 1821 Henry Platt had established himself in Oldham as a manufacturer of cotton spinning machinery, the formation of the company. 1822 Entered a partnership with Elijah Hibbert as Hibbert and Platt and later as Hibbert, Platt and Sons which developed from an assembler of parts manufactured by others to a fully integrated manufacturer in its own right. 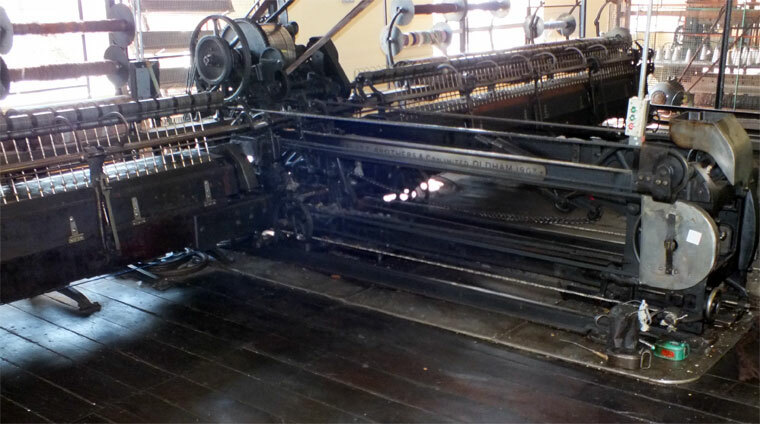 The company began to manufacture looms mainly for export. 1868 The company became a limited liability company under the chairmanship of John Platt. Platt Brothers were at the forefront of technological innovation and their plant in Oldham was the most highly mechanised of its kind. 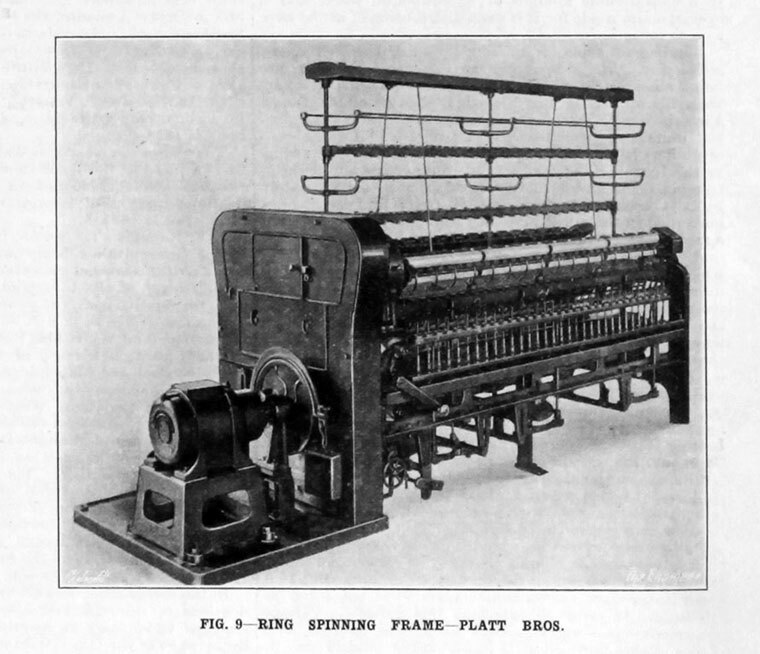 Platt systematically improved the technique of cotton spinning and perfected the carding machine, the roving frame and the self-acting mule. Platts' mules were unrivalled in their length and speed of operation, and in productivity. 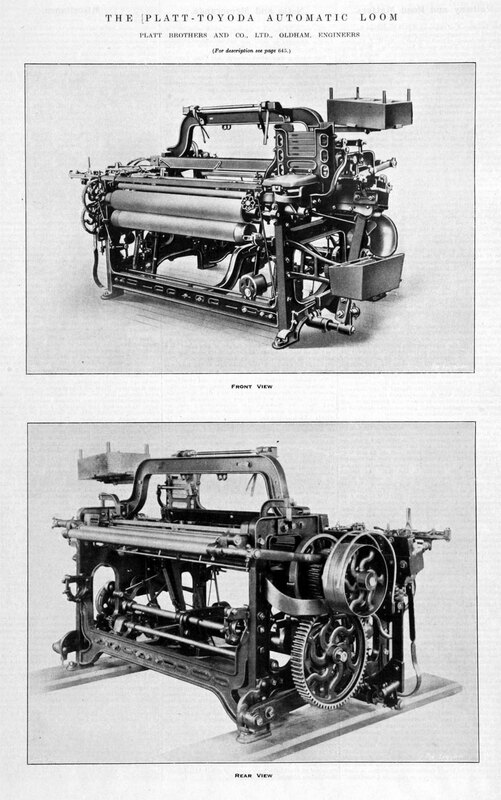 In 1879 Platts reached its highest recorded levels of power loom production and its export of spinning machines. 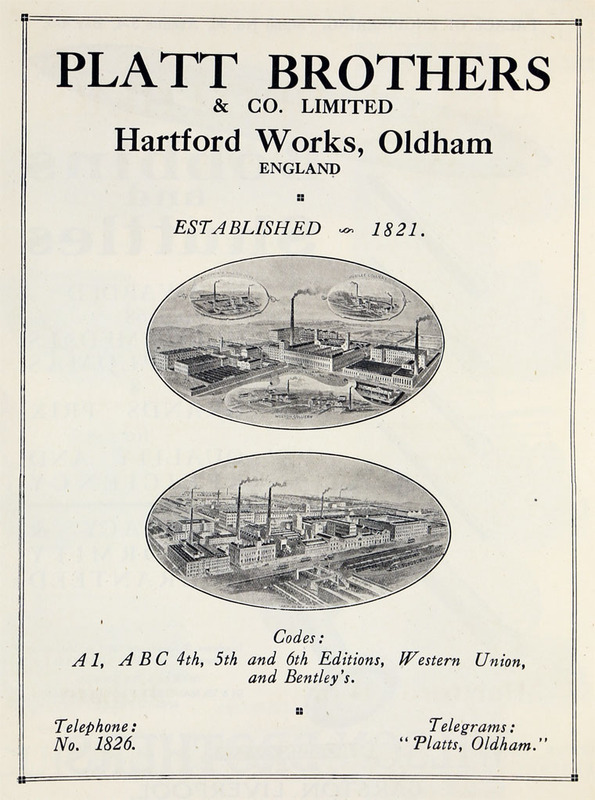 The Platt Company was the largest employer in Oldham and the largest maker of cotton-processing machinery in Lancashire and hence in the world. 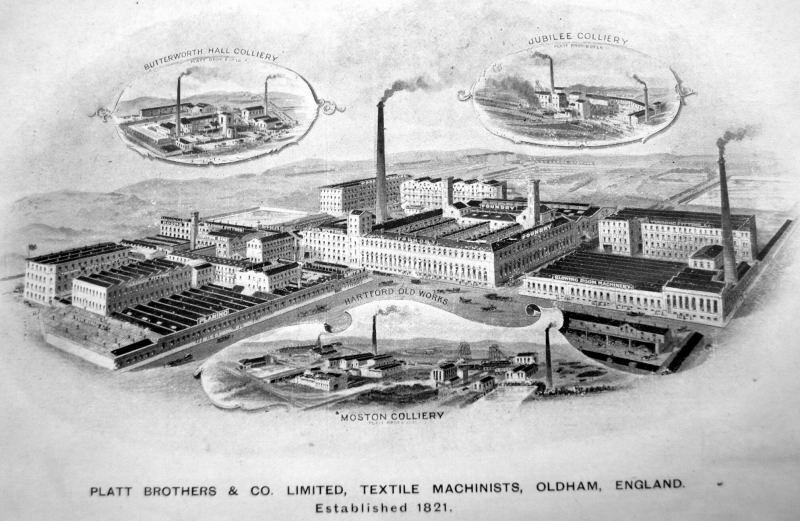 It became the largest textile machine makers in the world employing over 15,000 people, twice the size of their nearest rivals, Dobson and Barlow in Bolton and Asa Lees and Co on Greenacres Moor, Oldham. 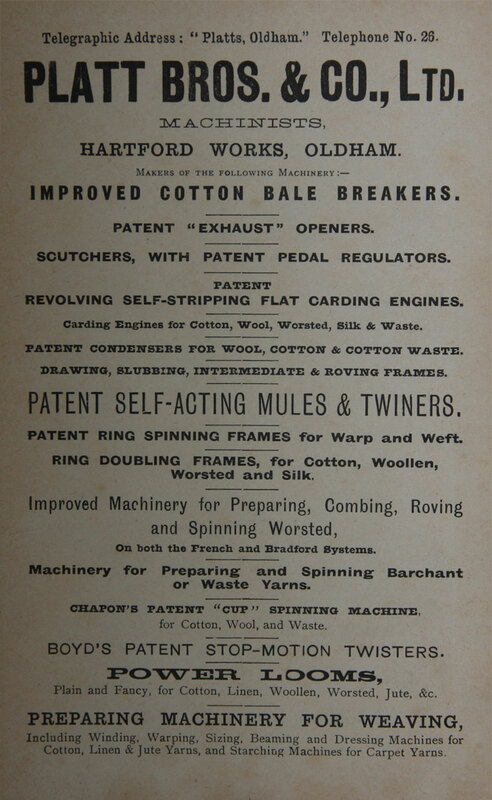 The Edwardian boom saw Platts reach its peak levels of production when the average length of new mules ordered from the firm reached 1,274 spindles. 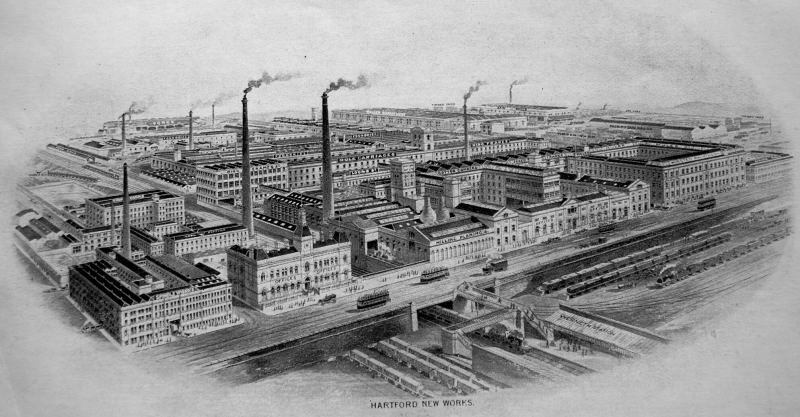 By the end of the 19th century, Platts were the largest engineering firm in the world, employing 15,000 workers. 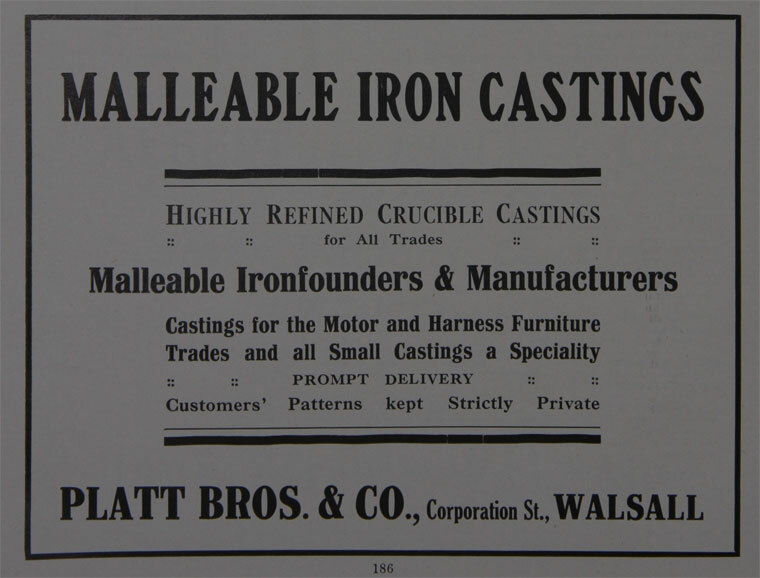 1898 Platt Brothers became a public company. 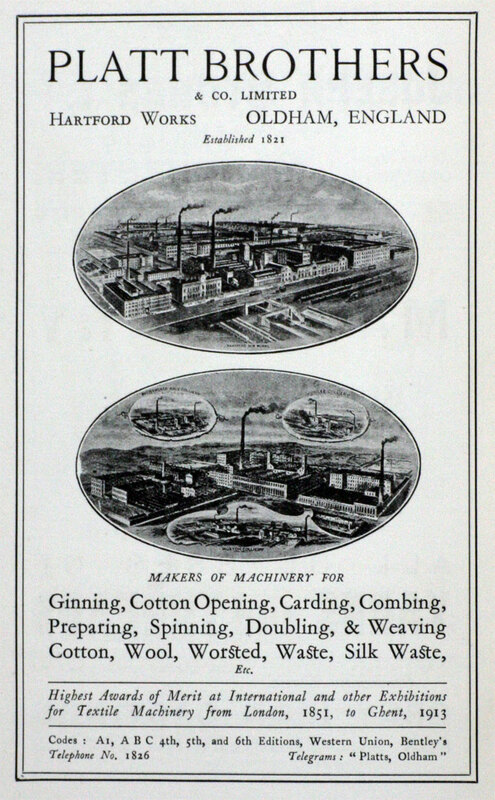 Platt Brothers also supplied plans for mills as well as machinery and fitters to construct the machines, both at home and abroad. 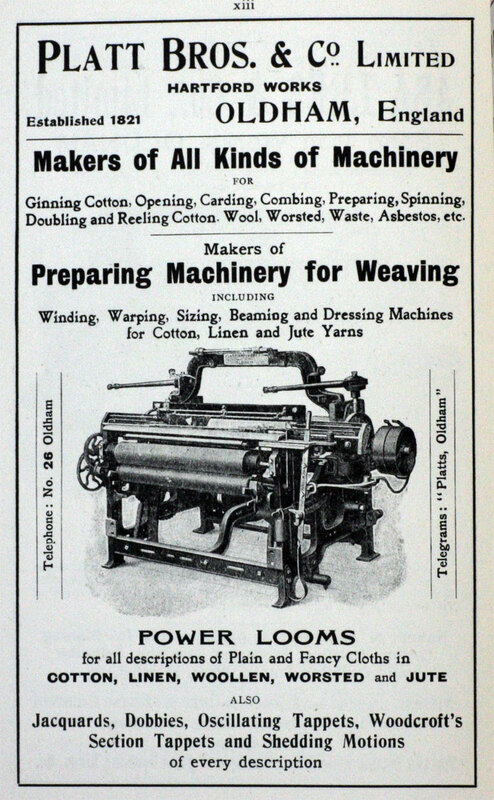 The 1920s and 30s brought a slump in demand for textile machinery and Platt Brothers began to lose money, prices for the few orders of machinery were driven down and would have resulted in one or more of the companies going out of business had it continued. 1931 Private company. To avert bankruptcy, Platts and their bankers appointed Sir Walter Preston as Chairman of the Board and it was he who subsequently proposed a merger of Lancashire textile manufacturers known as Textile Machinery Makers (TMM) consisting of Platt Brothers, Howard and Bullough, Brooks and Doxey, Asa Lees, Dobson and Barlow, Joseph Hibbert and John Hetherington and Sons, who sold their textile-machinery-making assets to TMM in return for shares. The constituent companies continued to trade under their separate names. Tweedales and Smalley were not initially partners of the TMM scheme but they joined later. 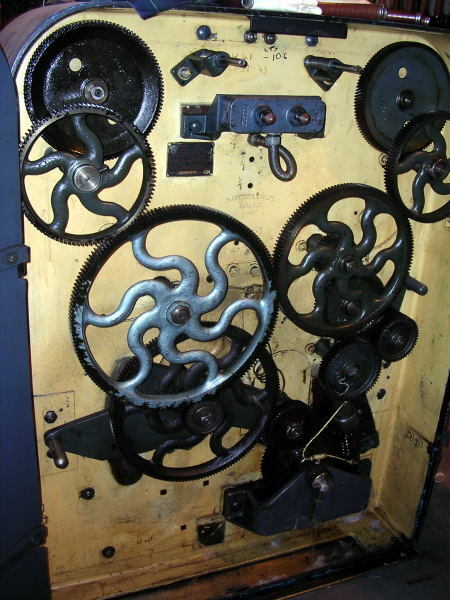 1953 Textile Machinery Makers remained the largest subsidiary of Platt Brothers (Holdings) Ltd.
1958 Scheme of arrangement to effect a merger between Platt Brothers and Co (Holdings) and J. Stone and Co (Holdings); Stones became a wholly owned subsidiary of Platts; the company name was changed to Stone-Platt Industries. The constituent companies of Textile Machinery Makers continued to trade under their separate names as the Textile Machinery Division of Stone-Platt Industries. During the late 1960s the company recognised that textile technology was in a state of rapid change, and the previous clear cut divisions between the processing of different raw materials had largely vanished. Also it was not logical for the constituent companies to operate separately - the multiplicity of units, R&D, manufacturing, marketing and sales needed rationalisation; in consequence a new company was formed in 1970, Platt International. 1982 Stone-Platt Industries closed and the few viable parts were sold off. A number of exhibits at Manchester's Museum of Science and Industry.